Trial and error is in Nervous System’s DNA. The generative design studio creates unique art, jewelry, and housewares through mash-ups of computer science, math, biology, and architecture and a process driven by testing the limits of emerging technologies and techniques. 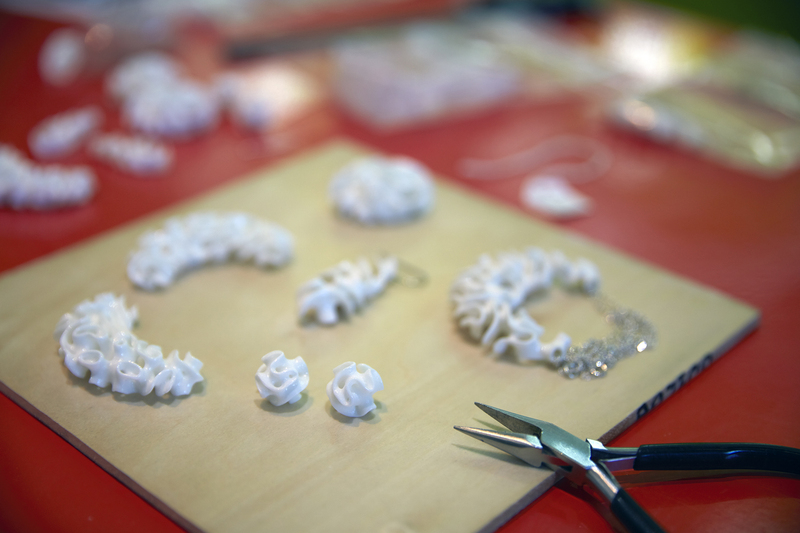 Today, Nervous System is launching their first-ever 3D printed ceramic product: “Porifera,” a jewelry line fabricated with Formlabs Ceramic Resin. The product line came together in just a few months after the studio beta tested the latest formulation of the resin, but its genesis is rooted in years of experimentation with various ceramic materials. In 2017, Nervous System experimented with an early version of Formlabs Ceramic Resin to create a cellular tea set, which is still in development. Learn how studio co-founders Jessica Rosenkrantz and Jesse Louis-Rosenberg turned years of material exploration into a final consumer product, from exploring concepts and testing geometries to developing their own glaze—and why they believe experimentation is central to success. Every Nervous System project is sparked by a different source of inspiration. Some are motivated directly by biology, beginning with computer programs that generate forms by mimicking natural processes, like how veins form in leaves. Other products are inspired by new fabrication techniques. This was the case for the Porifera collection. Design studio Nervous System creates unique and affordable art, jewelry, and housewares, employing computer simulation to generate designs and digital fabrication tools like 3D printing to realize products. “Ceramic materials are really beautiful and have nice qualities. They're inexpensive and strong, and they have this nice tactile feel; they can be glossy or more earthy,” said Rosenkrantz. The studio had previously outsourced the production of a porcelain housewares line, but were eager to merge the intricate geometries available with additive technology with the quality of traditional ceramics. They tested a variety of powder-based and resin-based ceramic 3D printing materials, but the weight and feel of the resulting pieces were still too distant from traditional ceramics. While beta testing Formlabs formulations, Nervous System helped steer material development to cross some of these challenges, like printability issues and final fired part density. Because Ceramic Resin is so strong in its green state, it’s possible to print intricate geometries that stay strong after firing. Nervous System tested a range of concepts with Formlabs Ceramic Resin. Printability was paramount: the material is experimental and required intensive exploration to uncover the ideal geometries. They began with working on a tea set, but honed in on a smaller product after running into challenges printing the set’s cellular structures and maintaining cost-effective production. 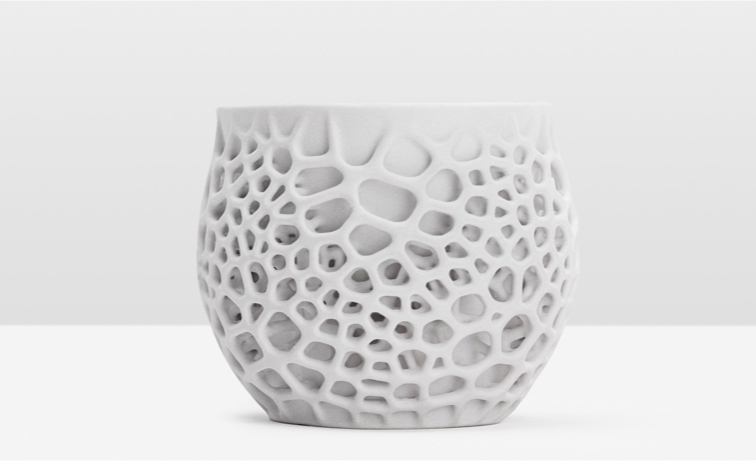 3D printing ceramics allowed Nervous System to fabricate thin, unique geometries for their Porifera collection. In the more wireframe-based designs like the tea set, one crack could affect the entire structure. In exploring smaller jewelry pieces, they found that continuous structures worked much better. In parallel to exploring 3D printing ceramics, Nervous System was investigating minimal surface structures, an offshoot of work with New Balance, and came across similar geometries in glass sea sponges. The thin, self-supporting structures of deep sea sponges were part of the inspiration for the Porifera collection. The sponges absorb silica from the surrounding water to form delicate glass skeletons. The sponges’ interconnected, self-supporting shapes were ideal for printing with Ceramic Resin, and also worked well for successfully placing and removing supports from the 3D printed parts. The team simulated the sponge geometries to generate forms that became the final necklaces and earring pieces for the collection. Nervous System simulated the sea sponge geometries to generate the forms that became the final necklace and earring pieces for the Porifera collection. 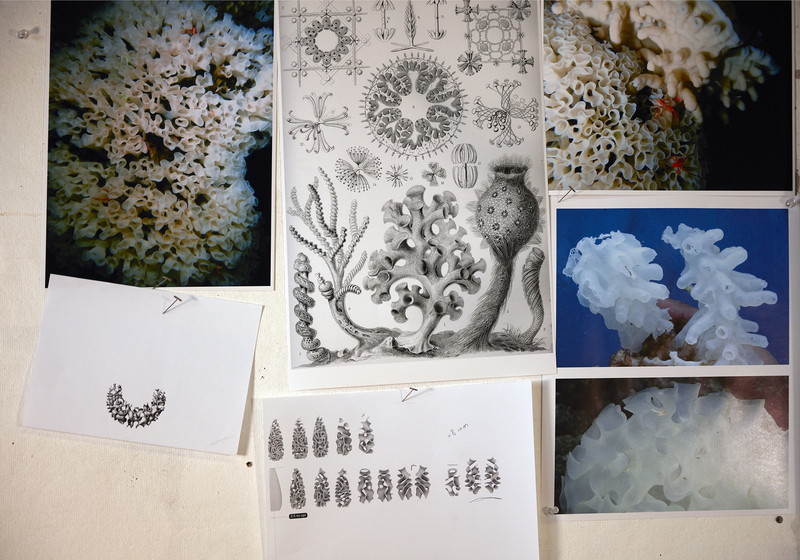 Learn more about how Nervous System developed the Porifera jewelry collection. It took a lot of testing to find a successful firing and glazing workflow. Nervous System’s final process influenced the Formlabs Ceramic Usage Guide, which any Ceramic Resin user should read in full before printing with the material. Previous ceramic materials Nervous System worked with did not reach the density of traditional ceramics, so parts in their fired state were still very porous, and required a different glazing process. After fully firing, final parts printed in Ceramic Resin are fully dense, and not porous enough to successfully accept glaze. To counter this, Nervous System glazes parts after a bisque firing. With the help of their ceramicist, the team realized they needed to fire parts at a much lower temperature to make them porous, then apply the glaze and fire at a higher temperature. “What we do is actually much more like a traditional ceramic process; we first do this process, called a burnout where all of the resin is removed and we fire it to a lower temperature—1900 degrees Fahrenheit, which is around a cone of 05. That leaves kind of a very brittle, porous part. We want it to be porous, because that way it accepts glaze very well,” Louis-Rosenberg said. Nervous System dips parts in glaze, as opposed to spraying, to ensure every surface of each part is covered. After the bisque firing, printed parts are brittle and porous. The studio dips parts in a glaze developed by their ceramicist based on commonly available recipes. Once glazed, parts are fired a second time to cone 10, which is around 2350 degrees Fahrenheit. In the past, Nervous System used a spray to apply glazes, but found that the intertwined geometries of the jewelry hid some surfaces from contact with the glaze. “It's weird. It doesn't sound like to your head that there's a lot of difference between 1900 Fahrenheit and 2350 Fahrenheit, but when you fire it to 1900 it comes up white and chalky. When you fire it to 2300 it comes out like glassy and smooth. So that's where all of the big changes happen is in that weird zone,” Rosenkrantz said. Sanding tip: Nervous System sands parts two separate times in their Porifera production workflow. After glazing, they sand the area of each part that will rest on the kiln to remove glaze from any section that could fire onto the kiln’s surface. Once parts are fully fired, they sand the back of each jewelry piece to remove any rough areas where the product will touch the body. Ceramic Resin is part of the Formlabs Form X product line. Behind Color Kit, it’s the most experimental product Formlabs has released to date. Beta testers like Nervous System are integral to the process of bringing experimental products to market. “I really like the idea of the Form X initiative; it makes it clear that Formlabs is comfortable with people doing experimental things with their machines. I think a lot of other manufacturers don't espouse that philosophy, and then it makes it difficult to experiment using their technology,” Rosenkrantz said. Nervous System beta tested Ceramic Resin, providing valuable feedback on the material’s capabilities and workflow. Developing new materials, including Form X products, is key to the Formlabs development process. Our in-house materials scientists are prone to pushing limits, and strive to expand the capabilities of our customers. Ceramic Resin is available directly from Formlabs in North America and Europe. Learn more about the material and how it works.